We will help put your money back in your pockets! At Consumer Credit Counselling, we are here to help consumers across Canada who are having financial difficulty by consolidating their monthly credit cards and unsecured loan payments into one affordable monthly payment. We can also arrange for a debt reduction or elimination of annual interest charges which will lower your monthly minimum payment. If you are falling behind on your payments or your balances are never dropping due to the high interest, we have a Debt Consolidation Plan that will be of interest to you. We’re here to help you become debt free. Please call us Toll Free at 1-800-565-4595 or fill in the contact form or click HERE to fill in our online budget worksheet and a qualified Credit Counsellor will contact you within 24 hours. Being in debt can seem very scary and overwhelming, we understand and we are here to help. Contact Us. Serving all clients across Western Canada, Eastern Canada and the Maritimes. Since 1991, Consumer Credit Counselling have helped Canadians reduce their debt, improve their financial situation and lower or eliminate all interest on their unsecured debt to become DEBT FREE. Consumer Credit Counselling has an A+ rating on the Better Business Bureau and we are licensed with Consumer Protection BC. 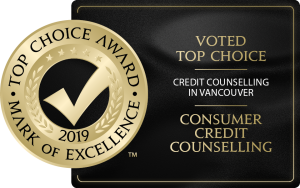 We have won the Top Choice Award for 2016, 2017, 2018 and just recently 2019 as the Top Credit Counselling company in Vancouver. Helping Canadian Consumers Become Debt Free For Over 25 Years!